We want to share the importance of recognizing and honoring your own personal matrix, your vibrational field and how it is holding and forming your daily reality. It is from this personal matrix that the life you experience and the body expression that you experience is created. The personal matrix is affected by all that it encounters. 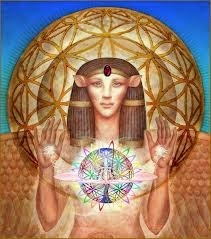 From the moment of conception, all the while the body is being formed in the mother's womb, there is an exchange and blending of the matrix. The family genetics are woven into the matrix; your parents' strongly held beliefs and emotions are woven into your personal matrix. The years of childhood, the experiences and encounters are woven into the personal matrix. The experiences that are painful, scary, fearful, limiting in any way are also woven in, as a blockage or tangle of your energy flow. It is these blockages and tangles that we would like to assist each human in releasing so there is a flow once again from your divine blueprint. Remember energy follows thought. You can begin to untangle any aspect of your personal matrix by the very thoughts that you hold and express. Vibrational medicine works on these subtle levels to untangle and release any blockages held from past memory or even the tangles that were given at birth from the family matrix. This work that is being done by awakened beings; it is coming in many forms and ways.